The girl is named Stilton (like the cheese). The bartender is Sammy “Two Toes” Tiffin, (so called because of an industrial accident to his foot causing loss of sensation in all but two toes), the narrator of the story and the night bartender of an unnamed bar in San Francisco. The snake is Petey, an African black mamba, who takes a turn with the narration now and then. Of course, the story starts with the dame. One who just happens to pick Sammy’s bar to walk into that specific night. Stilton (or the Cheese, as Sammy privately calls her). From the moment he saw her, Sammy was hooked. Once they kissed, he was a goner. Petey is in the picture because Sammy and his pal Eddie Moo Shoes plan to sell him to Eddie’s uncle in Chinatown for medicinal purposes. The deal goes downhill when Sammy’s boss, Sal, gets too nosy and opens Petey’s crate and the snakes does his reptilian thing—namely Bite, Bite, BITE!—leaving Sammy with a dead boss, one missing snake, a bully of a cop on his case, some black-suited government-types (except for Bailey who wears blue), and perhaps a little gray alien, or perhaps not. Then Sal’s body, and the Cheese, disappears and Sammy thinks they were taken by those guys in the black suits, except for Bailey, who can’t get with the program and is still in blue. Sammy may be fitted for that casket, sans Stilton’s kiss, sooner than he wants if he doesn’t find her or Petey or Sal’s body soon. You see, the Cheese was bribed by a general to go to a party given by a club he wants to join, so, being a girl who wants to put away a little cash for her future life with Sammy, she agrees, but when she gets there, the party’s cancelled. Seems something crashed in the desert near a place called Roswell in New Mexico, and the general, who happens to be in command of the base there, brought one of the occupants of the something along to impress the other guests. When he’s ordered back, his plane crashes, and those same government-types start chasing Stilton who’s only along for the ride and an innocent bystander, for cryin’ out loud, but maybe it’s mostly because she finds this little gray alien packed in ice and decides to take him with her as she vamooses. What follows is laughable chaos as Sammy searches for Stilton, tries to keep track of Sal’s meandering corpse, worries that Petey may be lurking in ambush with deadly fangs, and the men in suits are in pursuit. All while the streetcars clang and the sun comes up over the Golden Gate. To say this is Damon Runyon meets Men in Black with a pinch of Dashiell Hammett doesn’t do this novel credit. 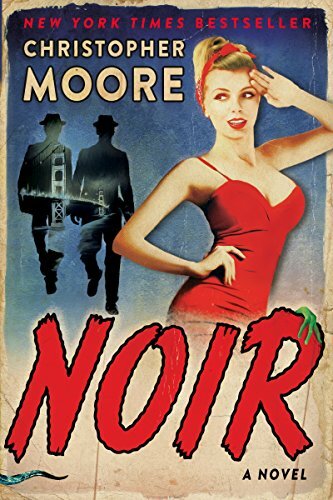 It’s witty, satirical, and hilarious with a delicious quiver of crime noir hovering over all. The wisecracks and snappy repartée don’t hurt, either. There’s a fantastic cast of characters ranging from a smart-mouthed youngster who lives in Sammy’s building to the aforementioned talkative Petey the Snake. San Francisco in 1947 is vividly and realistically painted in paragraphs of grammatical nightmares so complicated and convoluted by the time the reader reaches their ends he’ll have forgotten the subject. It’s not so noir one can’t see a happy ending in view, however, and thoroughly enjoyable throughout.